For a moment, imagine you’re attending a Met Opera performance… As you approach the arch-lined glass facade of the Opera House, you can see right into the warmly lit interior. There, a symphony of illuminated crystals sparkle over the inner atrium. Inside the theatre, another cluster of chandeliers centred by a grandiose starburst of crystals hangs low over the seating. As the lights dim and the curtain opens, the chandeliers glide upward towards the ceiling, dramatically opening the show. 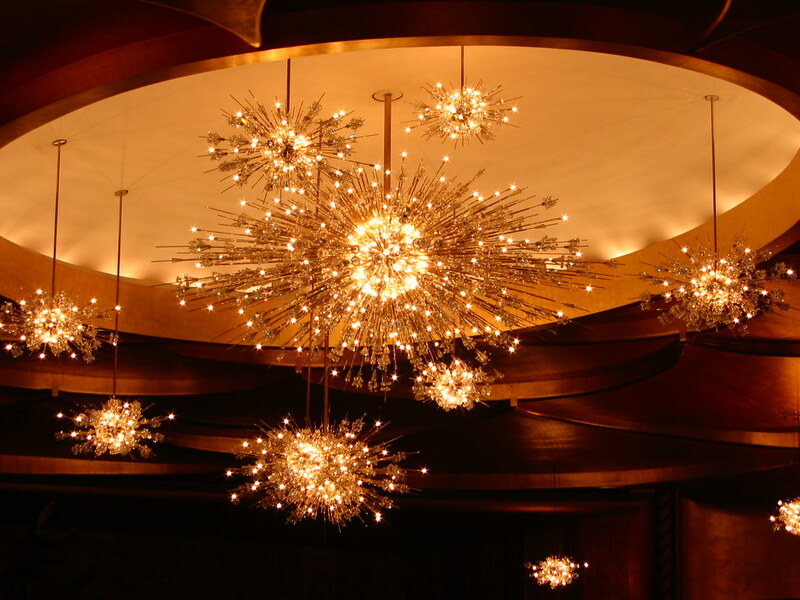 The Metropolitan Opera Houses’ sputnik chandeliers are a signature of its performances, interiors, and a period of midcentury design. The sputnik chandelier design was born in the atomic age of design. Following World War II the Cold War began, triggering an arms race between the former Soviet Union and the U.S.A. to develop bigger and more destructive atomic weapons. In 1957 the former Soviet Union launched the first satellite named Sputnik. The following year America launched its own satellite and subsequently NASA was created. The world became fascinated by nuclear science and space exploration. This inspired an era of architecture and design that later became the Atomic or Space Age. If you’re not familiar with the aesthetic, think The Jetsons, the Seattle Space Needle or watch the short video below. One of the classic and enduring designs of this time is referred to as the “sputnik” chandelier, named after the Soviet Union satellite. Copied and varied aplenty, it’s hard to trace the design’s exact origin, but engineer Gino Sarfatti is commonly credited with creating the first of this midcentury icon–a pendant with radiating arms of various lengths stemming from a cental orb, each ray ending in a light. In the 1960’s as the Lincoln Center was being constructed, the Austrian Government gifted the United States 350 hand-cut crystal adorned, sputnik-style chandeliers and accompanying lighting fixtures to complete The Met Opera House. Those glamorous sparklers were produced by the glassmaking Austrian company Lobmeyr, with 90% Swarovski crystals. The Lobmeyr designer Hans Harald Rath was inspired to create small galaxies of light and crystal by a book about the Big Bang, presented to him by the Opera House architect Wallace K. Harrison. Lobmeyr were called upon again in 2008 to freshen up the aging chandeliers. They carefully dismantled the lights and flew them to Austria for refurbishment of the radiating frames, along with complete replacement of the 49,000 original hand carved crystals, with new laser cut Swarovski donated pieces. Now not all the original crystals survived the disassembly intact. Some were lost and others chipped or otherwise damaged. The less than perfect, but oh-so-unique crystals were upcycled into small reproductions of the chandeliers and jewellery pieces sold in The Met Opera shop. It was here that lovely shop assistant Stephanie, saw my aching desire to have one of those baby sputnik’s and redirected me to a more affordable solution–a beautiful hat/scarf pin. Being that one of my favourite soulful souvenirs to collect is jewellery, I couldn’t have fallen more in love with the piece and its story–a recycled crystal from an iconic chandelier, that witnessed 30 years of opera patrons enjoyment in the Lincoln Centre, New York City. For more on New York City, here are the 10 things I learnt the hard way while exploring the Big Apple, a dash of street art, and a packing list for Autumn and Spring.